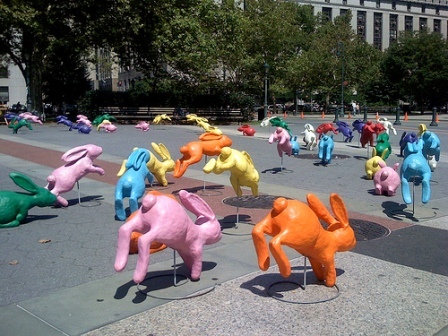 Thanks to coverage on the blogosphere, its been almost impossible to ignore the invasion of Sony’s giant bunnies. Event TV might have died with the advent of digital & satellite, but we appear to have entered the age of Event Advertising. Never mind simply spending a fortune on TVRs, it seems that with enough hype you can actually drive people to a campaign website before the ad has even aired. Which I suppose is a reflection on the staying power of a great proposition and a cracking creative concept. Previous Post Marketing to women? Don’t just think pink. All those rabbits give me Watership Down flashbacks.